Foragers and gardeners can propagate elderberry shrubs simply by taking a cutting and rooting it. Propagation from cuttings is a basic method used to start woody shrubs and some herbaceous perennials. For those who desire this incredible shrub, this is a simple way to start growing your own elder (Sambucus canadensis). The incentive to grow your own elderberries is obvious; one healthy, (mature), shrub can yield up to 10 kg (22 lbs) of berries. Elderberries grow throughout most of Canada, the U.S., and in many European countries. They are a highly sought-after berry for food and for medicine. The delicious berries (better cooked than raw) are made into preserves, pies, juices, teas, and they are very useful in making cough preparations. Elderberries are rich in antioxidants due to a high content of polyphenols. They also contain a higher concentration of vitamin C than oranges. 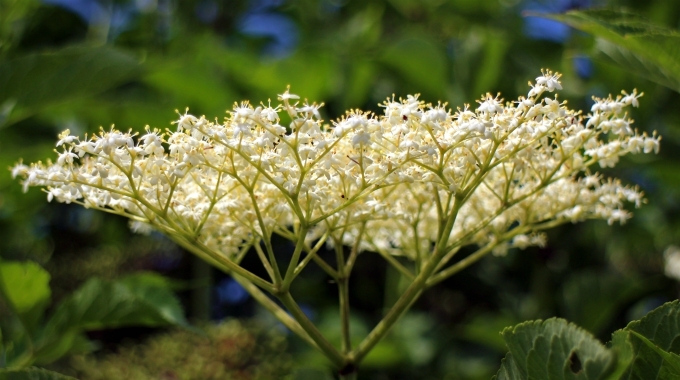 Butterflies and other insects are attracted to elderberry blooms. Its fruits are eaten by many species of songbirds. In fact, at least fifty species of songbirds, upland game birds, and small mammals enjoy elderberries during summer and early fall. White-tailed deer browse the twigs, foliage and fruit during the summer. The elder is outstanding as nesting cover for small birds. During summer, the partial shade under elderberry shrubs promote a dense ground cover of grasses and forbs that offers good loafing or feeding areas for broods of young pheasants and quail. The elderberry grows best in medium to wet, well-drained soils in full sun to part shade (minimum six hours per day is best). It tolerates a wide range of soils, but prefers moist, humus soils. It spreads by root suckers to form colonies. Elderberry is the best fruit tree for riverbank naturalization not only due to its tolerance to damp soil but also because of its roots which spread horizontally. This protects soil against erosion. Taking elder cuttings must be done while the bush is dormant, usually January through March depending where you live. Use pruning shears to cut about a 20 cm (8”) section of elderberry cane, and each section must include three sets of buds. Be sure to cut slanted to improve the canes ability to draw up moisture. Once cut, they can be placed in ozonated water. Never use tap water. Optimum conditions are keeping them at approximately 4 degrees Celsius (40 degrees F) for spring planting however this is not easily done for many. Alternatively, keep your cuttings in the coolest part of your home where there is some daylight. If keeping your cuttings in water, change the water every two weeks or so until roots appear; then place in a large pot with suitable soil. Some experts recommend to use a rooting hormone to helps prevent fungus and bacteria from infecting your cutting. It also helps speed the rooting process but most commercially available rooting hormone products contain a synthetic version of a class of plant hormones called auxins. Due to their synthetic nature, these are not approved for use in certified organic crop production. However, if you want to avoid chemical (recommended by many) then both unpasteurized honey and willow bark water are reported to work just as well as a rooting stimulant. Gather your cuttings as specified above, then place in ozonated water 24 to 48 hours. Fill a large container with a soil-less potting mix and using your clean index finger or a pencil, create a hole in the potting mix into which you will insert the cutting. Doing so helps to insure that you won’t knock off too much of the rooting (honey) hormone when you plant your cuttings. Plant up to three cuttings in each large pot by carefully inserting the cut end with the honey into the soil-less potting medium. Be sure to leave the top nodes located near the flat end of the cutting exposed as this is where the new elderberry plant will develop leaves. Water well until the soil-less medium is soaked through. The best place for your elderberry cuttings to root is outdoors in a sheltered and shady spot however, you can choose to root your cuttings indoors but leave them in the coldest spot of your house. Be sure to check the pots weekly to ensure that the soil is still moist and water as needed. When they’re ready and there is no risk of freezing temperatures, plant the elderberry cutting into quality soil with good drainage. Roots grown in water are more fragile than ones grown in soil, so wait until they appear to be sturdy before planting. The best permanent location for an elderberry bush is an area that receives at least six hours of direct sunlight per day and will allow the growth to get about 3 metres (10′) tall and 2 metres (6′) around. Elderberry is one of those bushes that “sleeps, creeps and then leaps”, meaning that it spends most of its first year establishing a good root system, begins to take off on the second year, and then grows vigorously during its third year. You can control the size of your elderberry bush by pruning away the old third year wood and removing any canes that are growing where you don’t want them to be. Yields of 5.5 to almost 7 kg (12 to 15 lbs) of fruit can be expected per bush in 3 to 4 years if managed properly. If you plan on moving within three years of planting your cuttings, then be sure to plant one cutting per large and deep pot. This way planting them at your new home will not cause them much distress. Only one question – I would like to plant them in the bank of a south-facing ditch (perfect, right?) but black walnuts are already trying to colonize here – I have been cutting them back but worry that the juglone in the soil won’t be compatible with elderberry plants. I know some plants co-exist with black walnut, but many, especially in fruit and berry competition (my apple tree died, as did the roses) are susceptible. Any help? I don’t know how well elderberries will fare with black walnuts as their neighbour. That would be a question to ask someone at a local garden centre. Great question though! From everything I’ve read, they are resistant. I am going to try them on my property, which has many mature walnut trees. I don’t see why elderberries can not be grown along black walnut. I had black walnut Trees and grew currents and other berry bushes in the same area, including an apple Tree and a quince tree, they all did well together. Many people claim they are not good companions. In my experiences, I have never seen an elderberry near a walnut tree. Thank you! Very informative article! I’ve read that elderberries need a couple of different varieties for pollination. If I use wild cuttings, how do I make sure I have different varieties? I’m new to growing elderberries, as I’ve only bought dried elderberries before. But the thought of having my own supply of elderberries is very appealing, as the dried ones are getting more and more expensive as demand increases. Thank you for answering my questions. Your local garden centre would be the best place to get the answer! What is ozonated water? . Ozonated water is water that has been put through the process of ozonation, which in turn removes bacteria and chemicals from the water and makes it more pure than it was before. VERY INFORMATIVE! I have some property and will have to do this – never thought about it before. Would this work for serviceberries too? Really loaded with great info. I started mine! Thank you!